Earlier this year, Spotify beat Google to the punch when it announced its own recommendation engines for podcasts and video—not just songs. 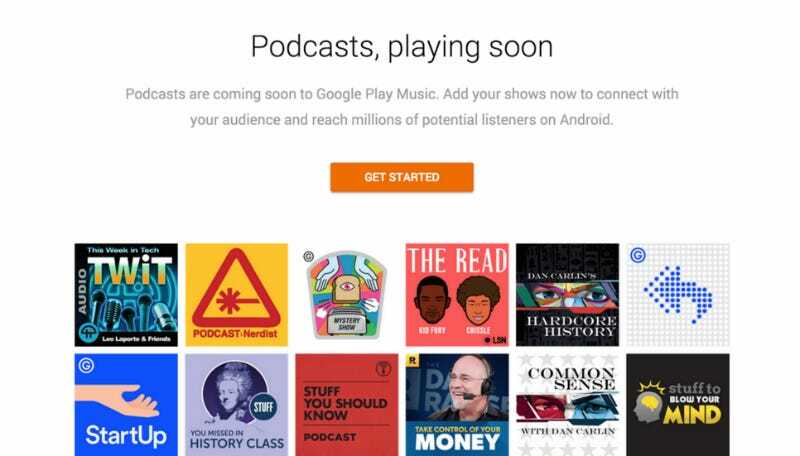 Now, Google Play Music is playing catchup and adding podcasts into its own audio offering. The announcement was posted on the Android Official Blog today. Podcasters will soon be able to upload their content for listeners, ahead of the official launch. Right now, unfortunately, this is only open to US podcasters. But the idea is that Google will suggest podcasts based on your interests, mood, and what you’re doing, like if you’re working out and want to listen to This Week in Tech on the treadmill. Unfortunately, there’s still no official launch date for the service. Google Play Music is quickly becoming one of the better tech deals on the internet. Despite YouTube Red’s mixed reception, you can get full access to YouTube’s new video platform and streaming music and original content through Google Music for only $10 a month. Adding podcasts only sweetens that deal. So far, big ‘casts like Nerdist, The Read, and Stuff You Missed in History Class are on board with Google. Hopefully, it won’t be long before my smartphone can sense when I need a Chris Hardwick fix.